I’m not gonna lie- I’m a huge Twilight fan. A few months ago I might have said Hunger Games (partially because I don’t go to movies much) but Breaking Dawn changed that for me. I would not consider myself a Twihard by any means, but this movie was nothing that I expected. So, I might be behind in this. I haven’t watched an episode since school started, but that’s because you CANNOT miss one. So, this break, I am going to get all caught up again. Promise. I need to know what the heck happened!! I go out to eat A LOT. I work really late hours and then when I come home I have no energy to cook, so it’s so easy for me to just go eat somewhere. My favorite, most frequented place, is probably the little Mexican place like two miles from my house. We go there almost weekly sometimes. But I also go through addiction spurts and will go to the same place all the time, craving it, and then move on to something else. I’m currently addiction-food-free and trying to stick with thtat. I love my Keurig and have a monthly subscription from Green Mountain Coffee. I recently ordered these and I’m in love. It’s like vanilla heaven! It’s almost like white hot chocolate but not. I’m drinking like one every day. I need to skip this month’s order because I have so many boxes on reserve, but I really think I need to order more. I love these! Sour Cream Noodle Bake from The Pioneer Woman. It’s so simple to make, is so delicious, and it’s with items I always have on hand. I make it every couple weeks and LOVE it! My first one. It’s been an amazing year. I’m still trying to figure out this blogging thing. Figure out what readers like that matches what I like. (Crazy for me, my followers don’t seem to like these posts and I get like no traffic when they’re personal. Most bloggers say otherwise.) But the fact that anyone wants to read anything I have to say is very strange to me. Being elected as the President of a non-profit in 2013. It’s going to be a busy and exciting year, and I’m proud that others have entrusted our organization in me, especially given our trying times. Here’s to a wonderful 2013! So, did you know that tagging is all different now in Facebook. When they say they’re with you, it doesn’t go into your photos. You still have to manually tag someone like in the olden fb days. I didn’t know this at all and there were a ton of pictures posted on my wall this year that I can’t find because they’re not in my pictures. I’ll totally stop that from happening again, but I’m disappointed in the meantime that I can’t find them. Alas, I hunted this one down. 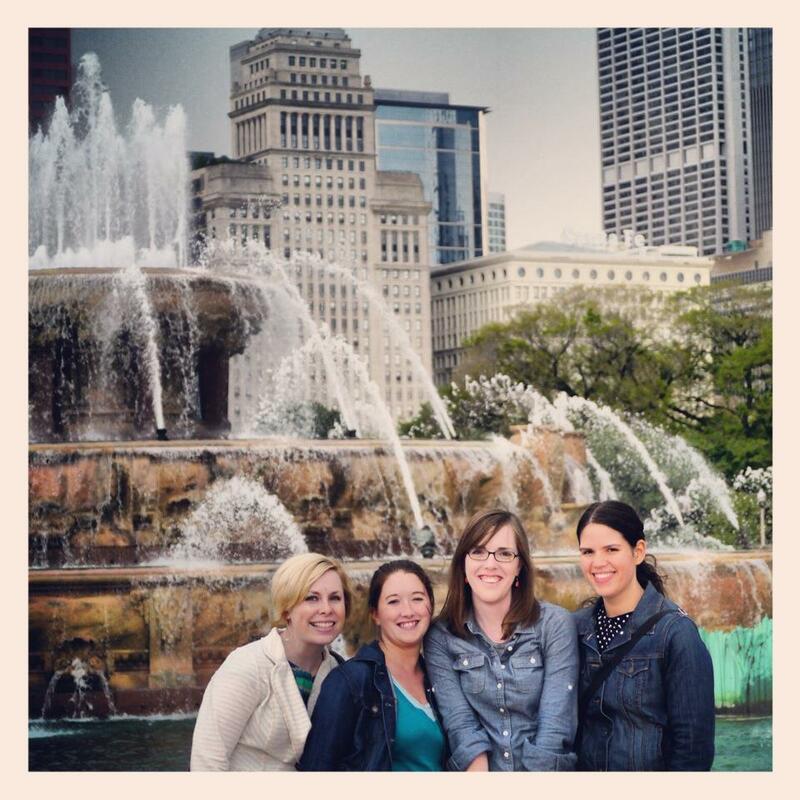 It’s from a Sunday morning in Chicago when some of my bffs from college came to visit. I had a *rough* night the night before so I’m looking a little rough myself, but I loved hanging out with them for a few hours. Even if it did rain. And I love Buckingham Fountain! I feel like this should be epic, and heartfelt, and sweet, and aww-worthy. Instead, I’m going to go with spending a few hours with a bunch of old guys. Enjoying Aerosmith in concert. Cross that one off my bucket list! Finding some peace in me. As I said, it’s been a rough year. I’ve questioned many things in my life. I want to find some peace and happiness next year and stop questioning everything and just live. Happily. Thanks for introducing me to Pioneer Woman. I don't cook much, but I think I can even do the Sour Cream Noodle Bake. Are you the blond in the picture? You're wonderful – and loved by God. Never doubt that!! No, I'm the short brunette next to the blond. And I love Pioneer Woman! Merry Christmas Susan!